JAWS Professional enables people with vision loss to independently use a computer with a keyboard, speech, or Braille display. With JAWS, you can navigate the Internet, write a document, create spreadsheets and presentations, email correspondence and more from your office, remote desktop, terminal servers, and from home. Please note: JAWS Professional software is downloadable software delivered via email within 2-3 days of receipt of order. This popular screen reader works with your PC to provide access to today’s software applications and the Internet for those who are blind or have low vision. Its multilingual synthesizer, Eloquence, speaks through the computer’s sound card, reading out information from the screen. JAWS supports standard Windows applications and other popular applications with little or no customisation. JAWS also outputs to refreshable Braille displays, providing unmatched Braille support. Languages include American English, British English, Castilian Spanish, Latin American Spanish, French, French Canadian, German, Italian, Brazilian Portuguese and Finnish. JAWS supports Internet Explorer with special features: links lists, frames lists, forms mode, reading HTML tables and graphic labels and more. The interactive talking installation lets the user set up JAWS quickly without sighted assistance. 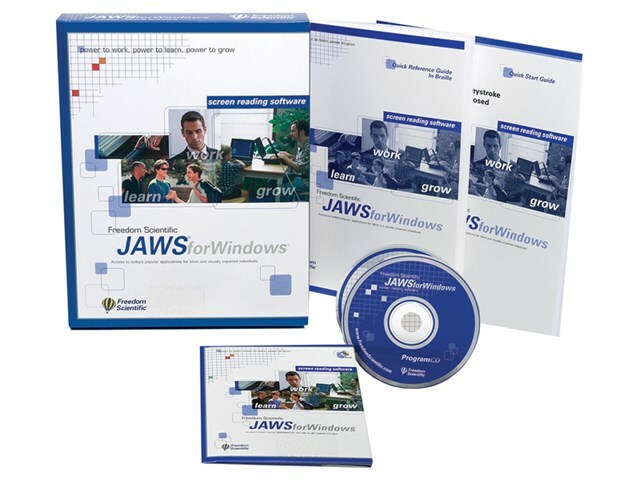 New users will appreciate the program’s Basic Training Tutorial with text and audio instruction to help them understand how to navigate the Windows environment with JAWS. The use of Eloquence requires a sound card compatible with the version of Windows you are running.